My eight-year-old daughter Julia peered at me, confusion etched into her round face. Amidst the chaos of Christmas morning wrapping paper and laughter, she held the contents of her gift: a small white card on which was drawn a simple fish. Julia studied it for a moment, and then she read the words printed on the card aloud. To say Julia was excited about owning her very first pet would have been a complete understatement. For days she could talk of nothing else. The wait until the pet store reopened after the holidays seem to be unending. Julia’s excitement mounted as she counted down the hours until she could go and pick out her already beloved fish. Finally, the much anticipated day arrived. Julia raced into the pet store and hurriedly found the area of the store in which the fish were located. She nearly swooned from the excitement when she saw the floor-to-ceiling tanks filled with fish in every color, shape, and size imaginable. There in the corner we saw a shelf filled with small glass bowls. In each bowl swam a single betta fish. The manager brought Julia a stool to stand on so she could carefully inspect each fish. She solemnly peered into every bowl, sometimes talking softly to the fish contained inside while other times silently stroking the glass. As I watched my daughter go about the serious task of choosing her pet, I began to fear that this could be a torturous process. There were so many fish from which to choose that the process seemed to be overwhelming even to me. No two were alike, and each one seemed more stunning than the one in the bowl next to it. Brilliant reds, shocking blues, soft purples, iridescent greens … there was even a shimmery gold one with bright orange and black flecks resembling a leopard print. My 13 year old daughter Maddie spotted an unusual blue betta fish with tiny black stripes. It had spiky fins which somehow gave it the look of a bird’s feather. She tried in vain to get her younger sister to choose this spectacular specimen, but Julia was not impressed. Ten year old Megan pointed out a fancy betta fish, vivid red in color with fluttery fins that whorled around it in the water. The manager, who noticed Meg’s interest, said, “That’s a Half Moon betta. Very pretty. Quite popular. A bit more costly. It will set you back $20.” As I steeled myself for the task of telling Julia we were not going to buy the $20 betta fish, I realized that my littlest girl wasn’t interested in this one either for she was already quite enchanted with another fish. With a quick glance, I looked to see which fish had captivated my daughter, discovering with surprise the fish at which she gazed so lovingly was truly the most unremarkable in the entire collection of dazzling fish. It was a dull, pale pink, and its fins weren’t very long, wispy, or elegant. Yet my smitten daughter watched with rapt fascination. So that’s how it came to pass that we took home the plainest betta fish in the store. I must admit I felt twinges of disappointment in Julia’s final choice. I had expected something more exotic, something more flashy. Julia did not seem to notice or share my disappointment. Instead, she beamed all the way home as if she knew she had found a rare treasure among all the glittering gems. Once home, Julia named her beloved fish Sushi, and cared for her as if she were the most amazing fish on the planet. Sushi lived in a glass bowl on the bedside table next to Julia’s bed. She never missed a meal. Her glass bowl was kept sparkling clean. It was obvious that Sushi’s presence brightened the small bedroom. As the weeks went by, I began to see such beauty in what I originally thought was just an unremarkably plain fish. Sushi would swim over as I entered the room. She seemed aware of my presence. And when Julia summoned me to watch Sushi perform a special trick, I had no more doubts that this plain little betta fish was indeed a unique treasure. Unfortunately, a few months after Sushi came into our home, Julia noticed a small bump on her side, near the fin. Obviously, there was nothing we could do but watch and hope our little friend was okay. Time passed. Sushi’s bump grew larger. It effected her ability to swim. I knew she was dying, but Julia continued to hold out hope. Through her tears, Julia said, “Well, I’m going to pray.” And she did. I stood in awe as I watched Julia pray for a miracle for her fish. And when she stood up, she seemed convinced her small fish would live, not just through the night but for a long time yet to come. Sure enough, in the morning, Sushi was swimming around her bowl, peppier than we had seen her in months. As Julia fed her, I watched with rapt fascination as the little miracle fish practically inhaled her food. I felt grateful our special friend had survived the night. Sushi lived on another two months, before quietly passing away while we slept. There were tears as we said our final goodbyes because Sushi was more to us than just a beautiful, flashy fish in a bowl. She was a good pet who brought a lot of happiness to our home. After Sushi’s death, I recalled my initial emotional response to fish Julia had chosen. I didn’t think she had made a good choice because Sushi didn’t have a beautiful outside appearance. But after the fish came home, I began to see my first impression was wrong. Suddenly, as I remembered the plain little fish, I felt God whispering in my heart, reminding me how He loves to use the unexpected and unworthy to carry out His plans. He used an elderly man to father an entire nation of peoples, as numerous as the stars and as countless as the grains of sand upon the shore. He turned the uncertain stutterer into a man who would confront a pharaoh, bring forth plagues, and lead an entire nation out of slavery. He used the very youngest and smallest soldier in an army of underdogs to overcome the impossible giant. He found the coward hiding in the threshing barn and used him to lead a tiny ragtag army into battle to defeat their unbeatable enemy. He took the young virgin maiden barely old enough to leave her parents and brought forth from her His perfect salvation. And that salvation … well, it turned out to be a babe born in a barn instead of King triumphant in battle glory. It was this same God who called out to a few weary fishermen, with their torn and empty nets, asking them to follow, using them to bring His gospel message of hope and peace to the far corners of the earth, so that He might turn them into bold fishers of men. His ways are not our ways, for He continues looks beyond outer appearances, into the heart of each soul. He still calls out to the weary. He still uses the small, the weak and the scared. He still defeats the enemy with the wounded sinner. And He promises to us that He has great plans for our lives too … if only we are willing to be used for His glory. 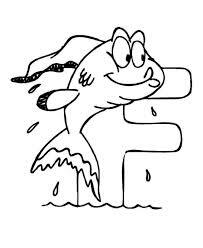 F is for the Fish who reminded me God wants to use me just as I am. You wrote a lovely story with good lessons embedded, especially since you also learned it from your daughter. Thanks for sharing. I am an AtoZer @ http://www.writer-way.blogspot.com. What a beautiful story! I’m so happy to have found your blog. Looking forward to coming back to read more. Thank you, Mary! I enjoy sharing my stories … esp. when God teaches me a lesson or two. 🙂 I am so glad you stopped by … Oh, and I was over on your blog this past weekend, really enjoying learning more about the Amish culture. I’ve got you on my regular reading list as well. I have done some work with a couple litters of feral cats. The one that has stuck around the longest seemed to be the plainest one of the older litter. I was able to trap two of her surviving litter mates and get them spayed/neutered, but this cat could not be trapped. She would eat the bait and leave the trap. After the other two no longer appeared, this cat remained, and cried at the window — I presume she was lonely. I coaxed her to me with fingerfuls of canned food. Now I see such beauty in this cat I once thought to be plain, and she’s a loyal outdoor cat (she is profoundly uncomfortable indoors) with exquisite beauty. God knows the inner beauty of all His creatures. He always finds ways to humble me when I am slow to see it. that is such a lovely and a spiritual post. Yes, the Lord shows His grace in the most unexpected individuals. I’ve discovered the same thing … grace in the unexpected seems to be God’s personal signature. Thank you, Christie! I already knew you approved and understood … but I’m so delighted you’ve said it again.